Ask at the Front Desk for information and pricing for the following amenities and recreation options. Torch Lighting Ceremony – Join the Resort Island Guides to watch the ceremonial lighting of the torches and the traditional Nifo Oti, a Samoan fire-knife dance. Held between the Lava Pool and the Great Ceremonial House. Lava Pool Party – Young Guests can dive for toys, engage in a hula-hoop contest and play musical stars. 'Ohana Treasure Hunt – Your family has to work together to find hidden treasures during this fun, interactive family hunt. Hula Dance Lessons – Guests of all ages can learn this traditional Polynesian dance. Other Activities/Games – Play Disney Trivia, Bingo, Are You Smarter Than... and Name That Singer, or participate in a Sandcastle Competition or Chalk Drawing. Each night (weather permitting), the legendary Electrical Water Pageant floats through the waters of Seven Seas Lagoon. The Pageant consists of 2 strings of 7 barges, each carrying a 25-foot-tall screen of lights featuring King Neptune and creatures from under the sea in an aquatic parade set to Disney music. The pageant concludes with an inspirational salute to America, with lighting set to a patriotic musical score. Reel in the fun with guided excursions and dockside fishing. Fishing excursions for adults or Junior fishing excursions (Kids' Fishing Around the World) for children are a great way to enjoy the sport of catch and release Bass Nitro fishing. Stop by the Marina to inquire. Learn more about fishing at Walt Disney World Resort. Enjoy a run or a walk along the scenic 1.5-mile trail along Seven Seas Lagoon. Jogging maps are available at the Lobby Concierge. Learn more about jogging trails at Walt Disney World Resort. The Resort's lakeside marina offers a variety of watercraft available for rent. Captain a Boston Whaler® 170 Montauk, or Sun Tracker® family pontoon boat. In addition, you can book private cruises and excursions on the Seven Seas Lagoon. Learn more about boat rentals at Walt Disney World Resort. Setting sail on a fantasy excursion is the perfect way to cruise the sparkling waterways of the Walt Disney World Resort, where brilliantly lit theme parks soar from the shores. Choose from a fanciful fleet of floating festivities for any special occasion. Reserve space on a fireworks cruise and watch spectacular fireworks light up the night sky from the gentle waters. Please call Member Services at (800) 800-9800† or (407) 566-3800† to book a specialty cruise. Guests under 18 years of age must have parent or guardian permission to call. Watch favorite Disney films at screenings on select nights. Learn more about Movies Under the Stars. Splash down at the Lava Pool or lounge the day away around the leisure pool. Experience island life at its most dramatic by frolicking in the sparkling waters around this active "volcano"—a 120,000 gallon heated pool that "erupts" throughout the day. Slip and slide your way down a 142-foot tubular waterslide that curves around the volcano. The expanded pool area features lush surroundings, a larger deck area and a whirlpool spa—plus special features like in-pool seating and underwater music. A zero-depth entry pool design features gradual beach-style slope into the water instead of traditional pool steps, enhancing enjoyment by little ones and Guests with disabilities. A specialized water wheelchair is also available, allowing access directly into the swimming pool. Nestled in a garden, the all-ages leisure pool offers a more tranquil swim for those looking to relax and unwind, and a freeform design—great for swimming laps. Take a tour of the pool! Indulge in one of our enhanced and upgraded cabanas, which offer a private, shaded oasis by the pool for a half-day, full day or evening for an additional fee. 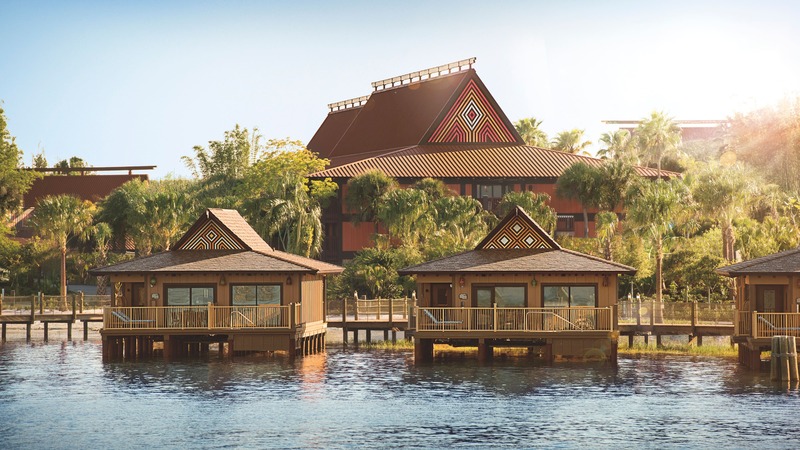 Learn more about cabana rentals at Walt Disney World Resort. Enjoy a friendly volleyball match on the lagoon-side court. Volleyballs may be checked out from Seven Seas Marina with your MagicBand or Key to the World card. Learn more about volleyball at Walt Disney World Resort. Transportation to Walt Disney World theme parks, water parks and Disney Springs is available. Destinations throughout Walt Disney World Resort, including Walt Disney World theme parks and water parks, are accessible by bus. The bus stop at Disney's Polynesian Village Resort is located a short walk from the lobby. Learn more about Walt Disney World bus transportation. Originally conceived as a public transport for the future, the Walt Disney World Monorail System has 3 separate beams that travel throughout Walt Disney World Resort. There is a convenient Monorail stop right outside Disney's Polynesian Village Resort which can whisk you to the Magic Kingdom park in minutes. Learn more about Disney Monorail Transportation. Enjoy a quick trip across Seven Seas Lagoon from the Resort to Magic Kingdom park or Disney's Grand Floridian Resort & Spa on a water taxi. Learn more about watercraft transportation at Walt Disney World Resort. Certain areas of Walt Disney World Resort are also connected by well-lit, paved, low-grade walking paths. Learn details about transportation between Walt Disney World destinations. Or contact Member Services at (800) 800-9800† or (407) 566-3800† for more information about transportation options for traveling throughout Walt Disney World Resort. Visit the Lobby Concierge to purchase tickets, make dining reservations and more. View the virtual tour of the Polynesian Resort Lobby. Take advantage of complimentary transportation and luggage delivery to and from Orlando International Airport. Disney's Magical Express is available from Orlando International Airport to Walt Disney World Resort. For return to the airport, Disney's Magical Express boards at every Walt Disney World Resort hotel. Make round trip or one-way reservations at least 48 hours prior to your arrival. Please call Member Services at (800) 800-9800† or (407) 566-3800† for reservations and additional information, or make your reservations online. Learn more about Disney's Magical Express. Contact Member Services at (800) 800-9800† or (407) 566-3800† for more information about transportation options for traveling to and from Walt Disney World Resort. Rent a car to travel to and from the Orlando International Airport to a convenient spot at Walt Disney World Resort. Alamo Rent A Car, the official rental car of Walt Disney World Resort, is conveniently located at the Orlando International Airport and at the Car Care Center near the parking exit of Magic Kingdom park. For Emerald Club customers, National Car Rental is also located at the Car Care Center. Shuttle service to and from the car rental facility and your location is provided 7 days a week, Monday through Friday from 6:00 AM to 8:00 PM and Saturday and Sunday from 8:00 AM to 6:00 PM (holiday hours may vary.) Schedule shuttle service at least one hour in advance. Call (407) 824-3470 for shuttle service and reservations. Contact Member Services at(800) 800-9800† or (407) 566-3800† for more information about transportation options for traveling to and from Walt Disney World Resort. Valet service and standard overnight self-parking is available to Resort Guests. Valet parking is offered at an extra cost. Note: Any Guest with a valid disability parking permit can enjoy complimentary valet parking while staying at this Disney Vacation Club Resort. Disney Vacation Club Members who wish to shop, dine or enjoy activities for the day at a Disney Resort hotel are not subject to the overnight self-parking fee. Charges for valet parking will still apply. Learn more about parking at Walt Disney World Resort. Indulge in Polynesian-themed gifts, Disney merchandise and other vacation essentials at the Resort shops. BouTiki is the resort's largest gift shop, located on the first floor of the Great Ceremonial House. Say aloha to tropical trinkets, Hawaiian shirts, hotel logo and surf wear, ukuleles and Disney character merchandise. Moana Mercantile is located on the 2nd floor of the Great Ceremonial House and features snacks, sundries, groceries, liquors, beer, wine, gifts, children's fashions, toys and Disney character merchandise. Theme park souvenirs can be delivered to your Resort. That way, you can keep your hands free while enjoying the parks. When you return to the Resort, you can pick up your packages at BouTiki. Stay connected with complimentary access in your room and at most public areas throughout the Resort. Disney Vacation Club Members can submit an order form to have groceries they purchase delivered to their Resort. Once your check-in window is open, visit “My DVC Membership” and select “My Dashboard.” Then, view “My Vacation Plans” and select your vacation to begin the check-in process online. Take care of some of your banking needs during your stay at Disney’s Polynesian Villas & Bungalows. A 24-hour ATM is located near the Front Desk in the lobby of Disney’s Polynesian Villas & Bungalows. Learn more about ATMs at Walt Disney World Resort. Guests may exchange foreign currencies at the Front Desk or with the Lobby Concierge. Learn more about banking services at Walt Disney World Resort. Stamps are available for purchase at BouTiki and Moana Mercantile. Send pre-stamped postcards and letters from the Front Desk, as well as pre-packed, pre-labeled packages. Learn more about mail services at Walt Disney World Resort. Smoking is only permitted at select outdoor smoking locations throughout the Resort. Disney Vacation Club Resorts offer laundry and housekeeping services. Daily housekeeping service is not provided for Members. A 24-hour self-service laundry room is available at each Disney Vacation Club Resort. There are also dry-cleaning and valet laundry services. Villas with one or more bedrooms feature an in-unit washer and dryer. For stays of 7 nights or fewer, Trash & Towel Service is provided on day 4, regardless of whether you're staying on a Member-discounted cash reservation, Vacation Points reservation, or a combination of both. For stays of 8 or more nights, Full-Cleaning Service is provided on day 4 and Trash & Towel Service is provided on day 8, regardless of whether you're staying on a Member-discounted cash reservation, Vacation Points reservation, or a combination of both. This cycle repeats for stays longer than 8 days. For all stays regardless of the length of the stay, daily trash removal will be provided. Rental Guests (non-Members or Disney Vacation Club Members not booking through Membership) receive Full-Cleaning Services every day. For all of the above, additional Housekeeping Services may be purchased. The Resort offers you the convenience of childcare at the Resort's supervised children's center, Lilo's Playhouse, plus in-room babysitting. Fees apply. Make your special occasions unforgettable with unique gifts and floral arrangements crafted by a Disney Florist sales specialist. Celebrate engagements, anniversaries, birthdays, special occasions, reunions and weddings. More than just floral arrangements, the pieces created by Disney Floral & Gifts are a Disney experience to cherish forever. Imagine the recipient's delight as a glass slipper and rhinestone tiara arrive on a floral pillow. Plant a surprise. We'll arrange it so that your kids discover a Pirate's Chest treasure with an eye patch, sword and more! Send your little princess an official princess proclamation with a twinkling tiara during her Disney Character Meal. A Disney Florist sales specialist can design your gift, arrange a special presentation to be left as a surprise in your room, delivered to your favorite restaurant or sent to a designated special spot in Walt Disney World Resort. An additional fee applies. Call (407) 827-3505† or check out Disney Floral & Gifts. Turn left onto Seven Seas Dr.